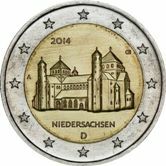 German Euro Coins have much to offer – three interesting motifs for the standard coins as well as a fascinating Commemorative Series covering the German Provinces. 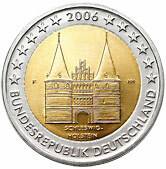 Germany was one of the founding members of the Euro zone and started issuing coins in 2002. Some Basic Facts relating to Germany. 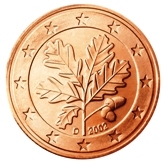 Oak Leaf for the 1 cent , 2 cent and 5 cent coins. Brandenburger Tor for the 10 cent, 20 cent and 50 cent coins. Eagle for the 1 Euro and 2 Euro coins. The Oak Leaf was chosen, at least in part, to give a feeling of continuity as it appeared previously on the old pfennig coin. The story of the Oak Leaf goes back a little further. their own coins. This was done away with in 1837 by the Munich "Coin Treaty" and the Oak Leaf was then chosen as the symbol uniting all in the now economically united Germany. Rolf Lederbogen was the designer of this series. The Brandenburger Tor (Brandenburg Gate) has long been a landmark in Berlin. After the war it came to symbolise the divided Germany and then with the fall of the wall in 1989 many Germans from east and west met at the Brandenburger Tor which has since become a symbol both for a united Germany as well as a symbol the unifying process in Europe. Reinhard Heinsdorff was the designer of this series. The Eagle was adopted as the national symbol at the formation of the German state in 1871. 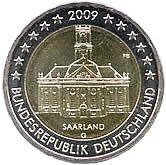 Between the wars it was used in the Weimar republic and then again in 1950. The current eagle, almost identical in form to that used in the Weimar republic ,was reinstated as the national symbol of the new Germany. This series had two designers - Heinz Hoyer and Sneschana Russewa-Hoyer. 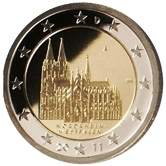 In all years where more than one commemorative coin has been issued, no standartd two Euro coins have been minted-not even in limited sets for collectors.This is because the authorities see the issue of two Commemoratives as being adequate to keep the supply of two Euro coins in circulation up to the required level. For the first three years there were, in addition to the German Länder series, common issues for all of the EU countries in the Euro Zone and in 2013 Germany also had a joint issue with France. 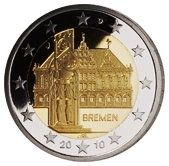 German Euro Coins are unique in that the coins are minted in five different cities and this is reflected in the coins by a small capital letter that represents the place of minting (The Mint Mark). 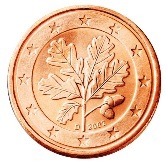 1 cent - Oak Leaf. 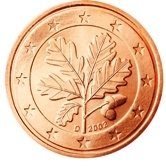 2 cent - Oak Leaf. 5 cent - Oak Leaf. 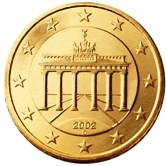 10 cent - Brandenburger Tor. 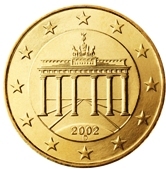 20 cent - Brandenburger Tor. 50 cent - Brandenburger Tor. 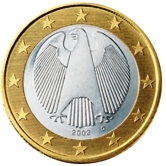 1 Euro - German Eagle. 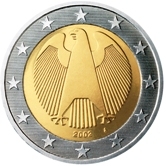 2 Euro - German Eagle. 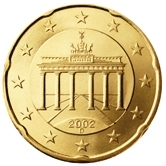 Around the rim of the Two Euro Coin appears the inscription "EINIGKEIT UND RECHT UND FREIHEIT" (Unity and Justice and Freedom) followed by the national eagle. 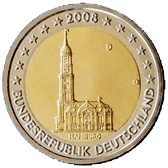 German Commemorative Two Euro Coins. 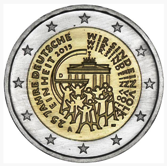 Germany delayed minting commemorative 2 Euro coins for a couple of years but then laid the scene for the next 16 years!! 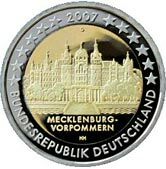 It was decided that each year a commemorative coin would be minted depicting one of the Bundesländer (provinces) - how appropriate this is for commemorative coins is debatable but the die is caste and so it will proceed until 2021. 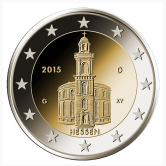 So although the actual representation of the future commemorative coins may not be known the themes are. 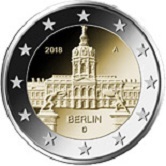 Below I set out a table showing what has been and will be in Germany from 2006 to 2021 - solely with regard to 2 Euro Commemorative Coins, of course! 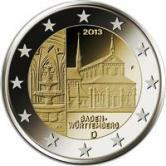 Note: A decision has been made to interupt the Bundesländer Series and no coin in this series will be issued in 2019. The series will therefore be completed in 2022. 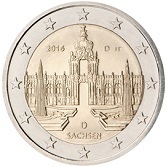 In 2019 a commemorative coin will be issued celebrating the 70th anniversary of the establishment of the post-war parliament. Why this is being issued instead of, rather than in addition to a commemorative in the Budesländer series, I don't know. 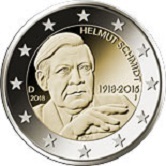 Germany has availed itself of the new directive (issued in 2012) that allows the Euro countries to issue two commemorative coins per year. 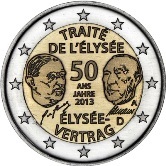 In 2013 Germany will, in addition to the Bundesländer series, be issuing a joint issue with France that commemorates the signing of the treaty of Élysée in 1963 . This is also the first joint issue in the Euro zone. Here follow the images of the coins. 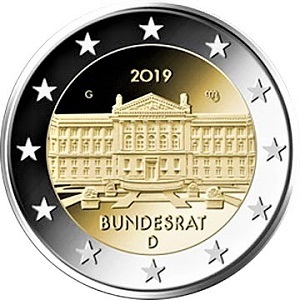 2019 - This coin commemorates the 70th Anniversary of the establishment of the Bundesrat – the upper house in the German parliament. 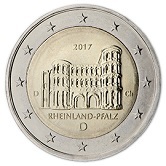 Return from German Euro Coins to Links to Specific Countries. 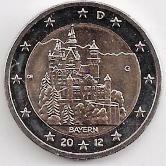 Return from German Euro Coins to euro coin collector.